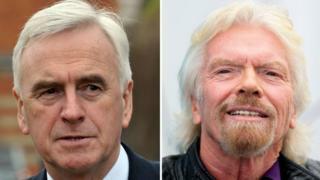 British tycoon Sir Richard Branson is a "tax exile" and should be stripped of his knighthood, shadow chancellor John McDonnell has suggested. Mr McDonnell told the Sunday Mirror Sir Richard wanted to "undermine" democracy, after a row over Jeremy Corbyn's journey on a Virgin train. Earlier this week, Sir Richard's Virgin Trains released footage disputing Mr Corbyn's claims about overcrowding on one of its services. Sir Richard has not responded. Speaking to the newspaper, Mr McDonnell said former BHS boss Sir Philip Green should also be stripped of his knighthood. It comes on the day that the last BHS stores close for the final time. Sir Philip has not commented on the remarks. Mr McDonnell said it was time to "take control" of the honours system, adding: "The whole purpose of the honours system is undermined when the rich and the powerful can collect their gongs without giving anything back. It's even worse when tax exiles are given honours." He continued: "And you should certainly have [honours] stripped from you if you subsequently have been found to be not acting in the spirit of our country." He singled out Sir Richard, calling him a "tax exile who thinks he can try and intervene and undermine our democracy". There is no suggestion the businessman, who lives on Necker Island in the British Virgin Islands, has done anything illegal. In 2013, Sir Richard said he was living on the island because of a love for the "beautiful" location - not for tax reasons. Responding to Mr McDonnell's comments, Labour MP John Woodcock, a prominent critic of leader Mr Corbyn, tweeted: "Dare to question Saint Jeremy's version of the truth? John McDonnell will strip you of your knighthood..."
And speaking at a rally in Hull, Labour leadership contender Owen Smith said: "I think the suggestion John [McDonnell] is making is that Branson should lose his knighthood for telling the truth about seats on his trains. "I can't say that I think that's a reasonable suggestion." Earlier in August, footage emerged of Labour leader Mr Corbyn sitting on the floor of what he dubbed a "ram-packed" Virgin train. However, Sir Richard later tweeted to say Mr Corbyn had walked past empty seats, with Virgin Trains releasing CCTV of the incident. In response, Mr Corbyn's campaign team released footage of Mr Corbyn walking through a busy carriage and said: "When Jeremy boarded the train he was unable to find unreserved seats, so he sat with other passengers in the corridor who were also unable to find a seat. "Later in the journey, seats became available after a family were upgraded to first class, and Jeremy and the team he was travelling with were offered the seats by a very helpful member of staff." Why did Sir Richard Branson take on Jeremy Corbyn?